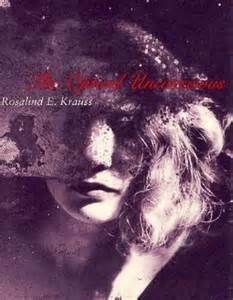 Beginning in the late 1970s, two traits of Rosalind Krauss's writing (and the writing of others around her, including some who were included in the opening years of October) were repeatedly noted by historians and critics: the apparently unprecedented density of different arguments within a single text, and the unexpected appearances of a number of theoretical and methodological sources presented in succession. Those two traits came to be noticed differently in the 1990s and afterward, and that has led to differing ways of reading her texts, and to divergent senses of what counts as writing, voice, narrative, and argument in her works—and by extension, in the ongoing influence of the writing associated with October in the years on either side of 1980. I'll open with some thoughts on the ways that reading habits may have changed, and then turn to chapter 5 of The Optical Unconscious. James Elkins: What struck me reading was the question of his awareness of those jumps. The margins of my copy are annotated “illegitimate conclusion” (when he asserts that “the paradigm for the allegorical work is thus the palimpsest”), “unnecessary move” (the idea that “allegory becomes the model for all commentary”), “wildly unconnected” (the move from allegory as appropriation to appropriations in contemporary art). Some of these discontinuities are willed or hypothetical. Others, it seems to me, are not proposed as such, and I can’t distinguish the two. On page 71, for example, Owens says that the impermanence of site-specific work “suggests” photography has “allegorical potential.” That “suggestion” excludes the reader and so at that moment the essay declares either a logic that readers won’t be sharing, or an obliviousness to justification that is itself baffling. Hal Foster: Those texts that concern Owens came to him, came to most of us, without context and simultaneously. They were put in play together, not processed, and connected to artistic practices, which were often also various. Sometimes it made for a killer punch, sometimes for a witches’ brew. But it did get lots of people—artists, critics, curators, students—thinking. This is a typical early October essay in the sense that it moves less by argumentation than by juxtaposition. In a way it performs its object: it is an allegorical text, too. From start to finish the text is read through other texts.… You also have to remember how young these people were. Craig was twenty-nine when he wrote this amazing text, as a sometime graduate student but also as a public critic. Given what Foster notes, it's interesting that essays like "The Allegorical Impulse," and others in Foster's collection The Anti-Aesthetic and in the first years of October, are read carefully and slowly in graduate seminars, with a close interest in what is taken to be their methods and references. The seminar in 2010, which was attended by about thirty scholars, didn't want to read that way, and instead we ended up talking about the political moment, the youthfulness of the writers, and their sense of discovery and exhilaration. That seems sensible to me, in that it was more true to the historical context of the 1980s. But it was at odds with the kinds of pedagogy that have made writing by Krauss and others so influential in the academy in the twenty-first century: texts like Owens's are taken to be dense and challenging, and not at all the unmanaged products of accumulated insights collaged from different discourses, or the allegories of their own subjects. It's the close reading of Krauss, and not the wider cultural reading that Foster recalled in the Chicago seminar, that matters for the discipline in the 21st century, because that sort of reading is what helps articulate the current worldwide dissemination of echoes and emulations of October, which in turn supports and articulates a certain practice of art history. The protocol of reading, from a twenty-first century student's point of view, would be something like this: mark and interpret unexpected turns, pursue and emulate the theory sources and their rapid succession. From this perspective an unacceptable text would be one that chooses a single theorist, someone already well known, and applies her ideas systematically (rather than, for example, by "juxaposition"). Or a scholar who builds a linear argument, in the manner I was taught when I first arrived in graduate school: first describe your artwork, then say what's known about it, and then apply your own reading. Formal analysis, iconography, social context: any list of strategies could be seen as inadequate, just by virtue of being a list. The current privileging of subtlety, complexity, and what Leo Steinberg called ambilogies (managed tiers of ambiguity) depends on an anachronistic application of close reading to texts that were assembled and read differently. What Krauss, Owens, Crimp, Foster, and others were doing around 1980—the moment of the Anti-Aesthetic, and four years into the publication of October—was more experimental, fragmentary, provisional. Their writing also drew on an unexpected range of theoretical references, and so what counted as authority shifted from the sure deployment of well-known methods to the unpredictable allusion to relatively unknown theoretical models. The fifth chapter of The Optical Unconscious echoes these early strategies and interests, but it was written almost twenty years after the inception of October, and well into the dissemination of her style throughout North American and Anglophone art history. Krauss's way of writing had become experimental in different senses. Some of the early unpredictability had condensed into a personal manner or method. 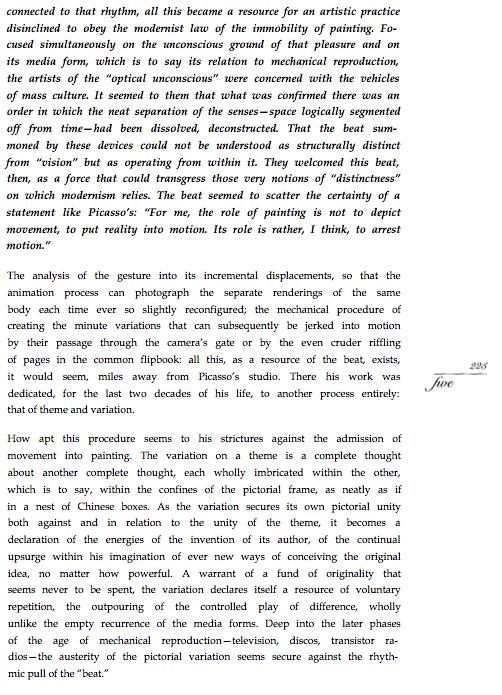 In the fifth chapter of The Optical Unconscious elements of the kaleidoscopic show of theories remain, for instance midway through the text when three pages take us from Hélène Parmelin's meditations on painting and the weather to a modernist critique of linear perspective, then to a resumé of Husserl's ideas of consciousness, to Derrida's critique of them, and on to Max Ernst (pp. 212-5). The chapter also registers some of the 1980's interest in undiscovered theorists and theories, especially the appearance of Jean-François Lyotard, who was known to Anglophone readers for his essays on the sublime, but not for his theories of the unconscious "matrix," which were in the book Discours, figure (1971)—a book that remained untranslated until 2010. 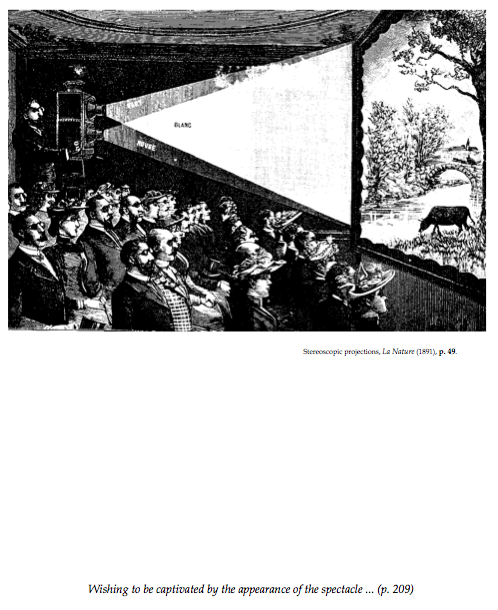 The kaleidoscopic early style is also on display in the chapter's elaborately convoluted opening, which is about 1960's "intellectuals in Paris" watching wrestling on television. This opening page systematically inverts her argument, beginning with the last things, and deferring the first, requiring readers to do the re-assembling. (1) Who needs permission (who is his own authority) for watching something as "vulgar" as wrestling on television? 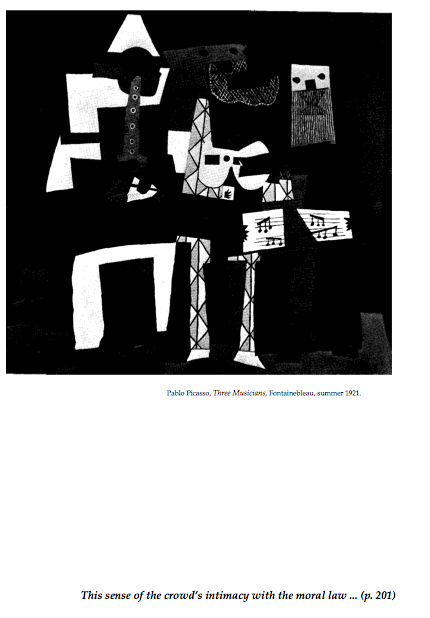 Note there is no claim that Picasso knew anything of Barthes or the "intellectuals in Paris." What kind of work does such an elaborate opening do? Does it concentrate Krauss's authority in a way that a more linear exposition might not? Or is it more a matter of preparing the reader for the kinds of hypothetical and theoretical associations that she will permit herself later in the chapter? The chapter as a whole is clearly a product of the early 1990s, partly because it has a simple large-scale structure: it alternates passages in roman and in italics in order to represent strands of modernism (personified by the late Picasso) and postmodernism (personified by its progenitors, Ernst and Duchamp). The key conceptualization in the chapter is provided by Lyotard's concept of the matrix—which Krauss develops in other chapters into the concept of the pulse, and which she repeated in the book Formless; the matrix and pulse are both ways of naming irregular or failed repetitions or structures. Because of this it makes sense that the A:B:A:B structure should itself break down: otherwise the chapter would be proposing itself as a modernist form, even though the theoretical content, from Lyotard, is paradigmatically postmodern. The A:B:A:B alternation does in fact break down in the argument that Picasso's use of sketch books as flip books is a form of "opening" onto whatever is "behind the picture" (pp. 229-30). In this way the chapter enacts its theme, and form fits content. Or seems to: there are other things happening in the text that break up what I take to be Krauss's intention to have content interact with, or speak alongside, form. Those other things have to do with the way the chapter works as writing: how the author's voice is developed, how fiction writing is represented in the chapter, and how the illustrations are arranged. I will consider each in turn. First there's the device of quoting Picasso scholars as a single anonymous authority. The phrase she uses is "the art historian," as in "the art historian discusses the sketches" (p. 226). The endnotes reveal she is citing a half-dozen different art historians, but readers are meant to think that's not significant, because there are no endnote numbers in the text. This form of citation produces a distance between her book and the discipline of art history, and it is not easy to know how to understand that distance. An implication is that all art historians, and also the discipline of art history as a whole, are modernist: that's the conclusion that I think has to be drawn from the contexts in which she cites "the art historian." But because these passages characterize a discipline, and not a person, they also produce her own text as a discipline comprised of one book. This is not the kind of conclusion I can imagine Krauss wanting her readers to draw, but it is written into the forms of her reference. It makes The Optical Unconscious into something other than a single-authored book, but it leaves unsaid how its author achieved her distance from what "the art historian" writes, or what the nature of that distance is, other than a sum of specific references to Barthes, Lyotard, Husserl, and Derrida—which it cannot be, since they are only summoned to explain phenomena the author locates in the images and texts of the period. These half-hidden narratives about awareness produce an authorial voice that understands by awareness. In writer's terms, it's a difficult bridge to cross: we are asked to find our way from the position of a plausible reader, who doesn't know most of this material, to a narrator who knows all of it. This isn't only a move that increases authority, as it is likely to be experienced by a reader who is an art historian: it's a move that sequesters narrative itself, because it prohibits the kinds of imaginative relationships between writer and reader that inform most writing. The references to "the art historian" place her outside disciplines (she also proposes herself as being outside philosophy, but I will not demonstrate that here); and the thematic of lack of awareness and hyper-awareness of self place her outside of history—history is, after all, the very medium of incomplete self-awareness. Second, the chapter has a number of written passages, by which I mean prose that is intended to conjure places, moods, and states of mind, and which is incompletely anchored to verifiable facts. At times Krauss's writing is close to historical novels in its tone and its distance from historical fact. Such passages are clearly intended to be experienced as writerly, but it is difficult to pin down what sort of writing is being mimicked or emulated. Occasionally she is successfully poetic—there is Picasso in his enormous house, "surrounded by a wild mulch of objects" (p. 198). But often the prose is workable or unobjectionable, more like an inventory of things that could possibly be verified (some of which are mentioned in the endnotes). And sometimes her writing is poor, like a student's—"the grand pneumatic tumescence of an invented classicism" could work in a hyperbolic context, but it is stranded at the end of a classicizing paragraph (p. 198). There are places where the writing is apparently emulating mid-twentieth century fiction, especially Hemingway. In one place Parmelin is made to think "Under the flaming sun the sea is molten, a bucking sheet of metal, its surface radiating waves of heat" (p. 210). In other places the writing seems to be a parody of Irving Stone—another plausible "vulgar" mid-twentieth century source. This is the genre of the historical novel: we are inside the witness's mind, reading details that are not in the historical record. It's a treacherous genre, traditionally outside proper scholarship. (There's a spectacular review by E.H. Gombrich of Simon Schama's book on Rembrandt, in which Gombrich shows just how much, and how histrionically, Schama invented. It's the historian's prerogative to make that kind of critique in the name of the facts.) What is Krauss attempting here? Is she trying for adequately descriptive passages that can conjure Parmelin's unconscious modernism? Is she trying, intermittently, to parody the kinds of mid-20th c. modernist fiction that were the approximate counterparts of Picasso's life? Questions like these can arise only when an author shows a lack of awareness or interest in opportunities to become more fully a writer, the kind who could develop voices and motivations, and control the production and parody of different styles. Some capacities of fiction writing are harnessed and made to serve the argument about modernism and postmodernism; others seem to be invisible to the author, for reasons that aren't clear. Bringing unscholarly, "irrelevant," unquantifiable facts and images into the narrative is a traditional move in some historical writing, especially the often populist genre of historical novels; "the art historian" might say such writing is licensed provided it ultimately serves a legitimate historical purpose. But this is from an art historical point of view: considered as writing, the elaborated and imagined passages on Parmelin and Ernst feel uneven and unsure of their tone. What counts in this text, as writing? I think it is mostly a matter of structure rather than style. The collage-style juxtaposition of voices and theoretical sources derives not only from Barthes (and his well-known critiques of Michelet, Balzac, Hugo, and others), but from the "new novel" and writers like Robbe-Grillet. In other words "writing" is nonlinear narrative, metanarrative (which fits the themes of accelerating self-awareness), unexpected transitions (what Robbe-Grillet called "chafing"), structural fragmentation and realignment, and anti-bourgeois narrative forms. Writing is a theme in chapter 5, but only parts of writing: the full possibilities of writing—developing, inventing, and projecting modes, manners, and styles—is unaccountably absent. Their lack is unaccountable because the authorial voice, which posits and praises full self-awareness, should encompass modernist and postmodernist writing as well. Writing, in a fuller sense, is oddly truncated, abbreviated, or confined. Reading a draft of this analysis, which I posed online, the art historian Benjamin Lima suggested that Krauss's book has "an implicit narrative" of "the heroic critic" who vanquishes "ignorance," and that it works in parallel with another narrative, of "the heroic artist" who "can conquer ignorance with radical or advanced work." Lima concluded that "readers need stories, and stories need heroes. Krauss provides both, but many of her followers don't grasp this and are bored." If I read Lima's point simply, apart from the affective force of the personifications, it helps bring the ideally omniscient author's voice together with the occlusions of what counts as writing. The aspects of the text that I think remain unaccountable could be partly explained by the force of one theme (the unapproachably self-aware authorial voice) on the other (the sense of writing, which is compressed and truncated to make room for that voice). In terms of the discipline, Lima is right: Krauss's books—and especially this one, which is unusually experimental in regard to writing—are vehicles for moving her mode of oppositional thinking into territories of writing that are usually uninhabited by narrative ("stories") and identifiable voices ("heroes"). But the result is, from the point of view of fiction, deformed or abbreviated in its sense both of voice and writing. The illustrations produce an effect that disrupts the narrative in ways the author and narrator seem not to notice. The pictures come in pairs, on pages without text but with large-font captions that are quotations from the text. (I am reproducing two sets of pairs here.) 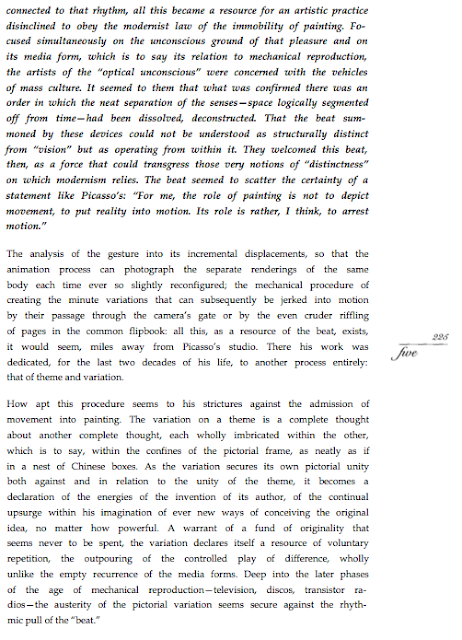 Krauss may have gotten the idea for that format from Barthes's Camera Lucida; it produces an unscholarly, associative effect, because the appearance of an illustration asks the reader to stop reading, consider the quotation-caption, and then, if the reader has the interest or patience, flip to the page that's indicated and see the original context. 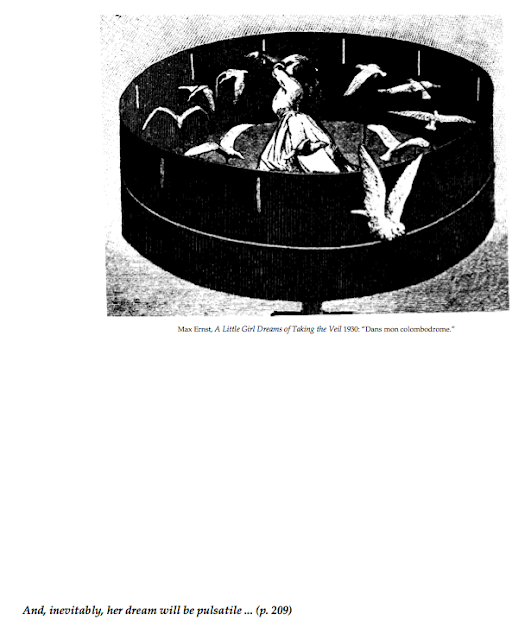 Sometimes the quotation / captions are to text on previous pages, and then the reader's task is to consider the relation between the caption and the illustration, and then the relation between that caption and illustration and the ones it's paired with. Reading attentively and thoroughly becomes a matter of periodically interrupting linear reading for sometimes unrewarding, often fairly random, tours back and forth through the pages surrounding the paired illustrations. My own experience is that these tours repeatedly demonstrate Krauss did not always plan or control the position of her illustrations, so I find myself wondering why it seemed sufficient to pair a very carefully staged text with a less carefully staged layout. At first I thought that the matrix or the pulse was being rehearsed in the semi-randomness of the placement of the pictures, but then I decided the inconsistent control of placement was an uninteresting form of randomness, and I stopped caring about it or reading the captions so assiduously. The placement and captioning of the images is much less careful than the ordering of the text, and that difference is hard to understand. Reading a draft of this material online, the artist Tom McGlynn offered this insight: Krauss's "optical unconscious," he wrote, "may have felt the images as too competitive with her own figurative language, which seems to have a conflicted relationship (maybe repressed) with its own allusive powers. This is a confusion I often feel with her writing. Informe as mask." It's always possible: I'm not sure in this case, where the arrangement might have been a more passive, less inflected kind of carelessness. 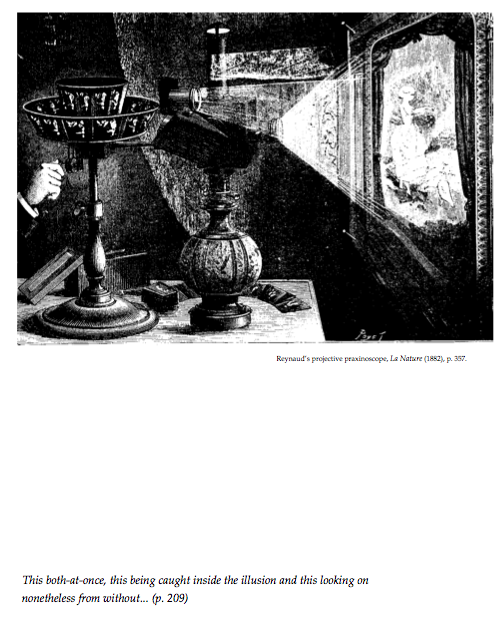 The Optical Unconscious was daring as art theory, criticism, and history. The stark contrast between roman and italic fonts dramatizes and enacts the chapter's theme, and even breaks down, toward the end, in accord with Lyotard (the principal theorist's) claims. But the chapter has an uneasy relation to writing in a wider sense. Krauss gives herself, by implication, an authorial voice outside of disciplines and history, which forecloses many narrative possibilities; she plays with writing in a poststructural manner, but the text does not understand writing as a theme in itself; and the formatting of her illustrations reveals a strange lack of care about a theme that should be central. The book is an interesting example of how writing in the broad sense, theorized by Barthes and others—whose conceptualizations were admired, in several texts, by Krauss—, had to be truncated in order to continue serving the verist ambitions of historical writing, and how that truncation itself had to remain untheorized.